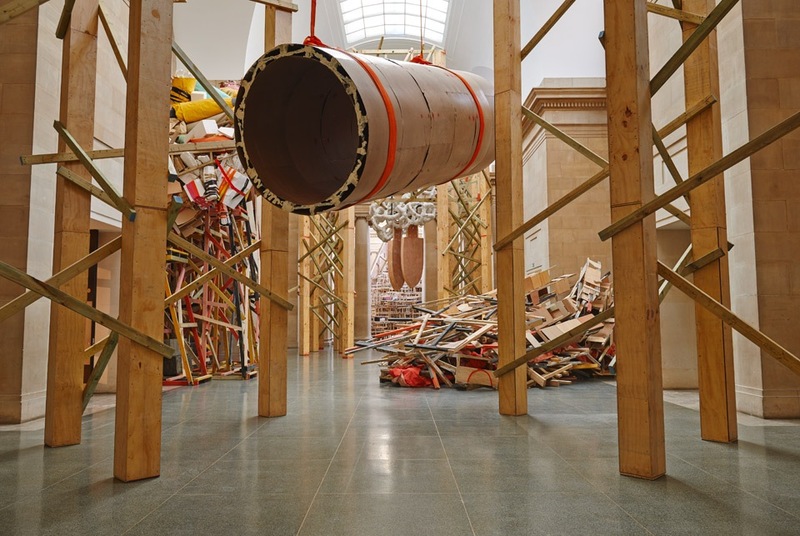 ‘Our era has been defined by falling monuments’ says Phyllida Barlow in an interview with The Guardian about her Tate Britain commission. She points out the tragedy, triumph, beauty and the immense grief evident in the collapse of a public icon; underlining the extraordinary range of emotive qualities that such a public piece of imagery conveys. 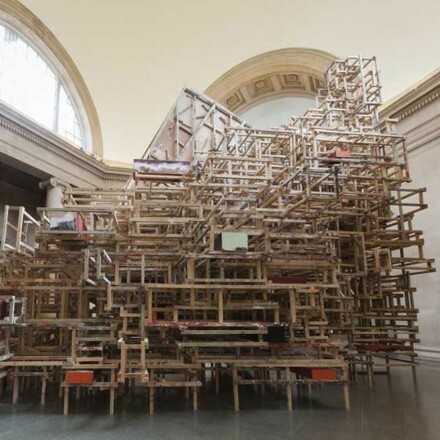 Barlow is delivering another major show defining the notion of monuments in a collaboration with Tate Britain as a part of the museum’s annual artist commissions. 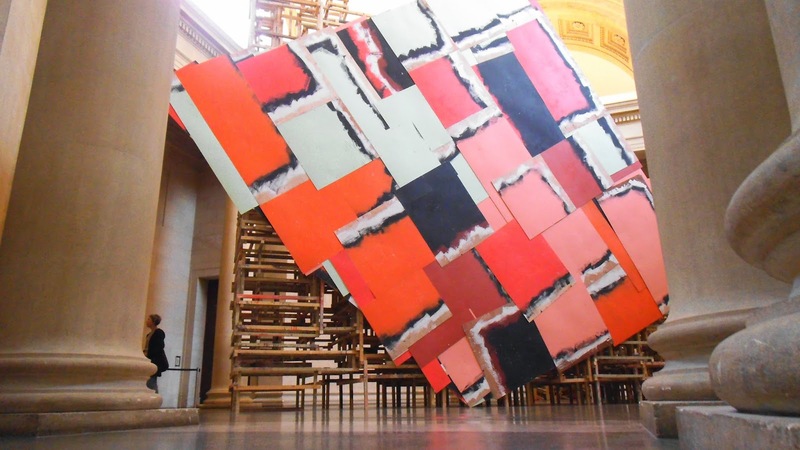 In a career spanning over four decades, Phyllida Barlow has only gained international recognition over the last ten years, and for years taught at the Slade School of Art to students including Tacita Dean and Douglas Gordon. Barlow, who is currently represented by Hauser & Wirth in London, has since been given the freedom to expand and explore her penchant for large scale sculptural works, combining everyday low-cost materials. 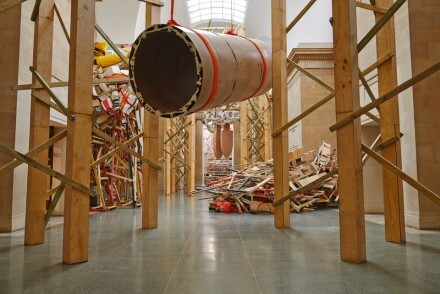 Barlow’s visually mesmerizing, ambitiously arranged installation techniques are currently on view at Tate Britain’s Duveen Galleries, celebrating the artist’s decades of meticulous artistry and challenging vision. Pushing the borders of collage, Abstractionism and sculpture; Barlow has built a unique style using materials like cardboards, polystyrene, cement and plaster to build captivatingly large scale structures, all while redefining the limits of exhibition spaces and production methods. 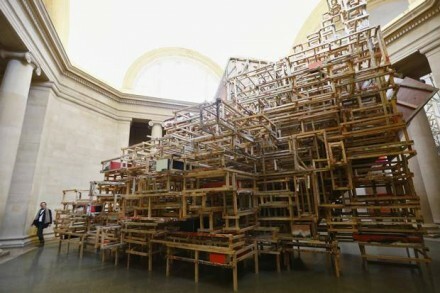 Barlow’s deliverance of her architecturally impressive technique is again no exception, covering the historic ambiance of Duveen Galleries with what can be defined as an ‘anti-monumental’ attempt as one of her seven installation titles suggests. Barlow’s dystopian, chaotic and challenging installations are the outputs of her experimental approach to unlikely materials, shaped in unexpected forms. Striking as a significant notion in Barlow’s practice is the element of contradiction coming from the incompatibility between her impressive use of scale, and the minimal value of her materials to build these large scale works. 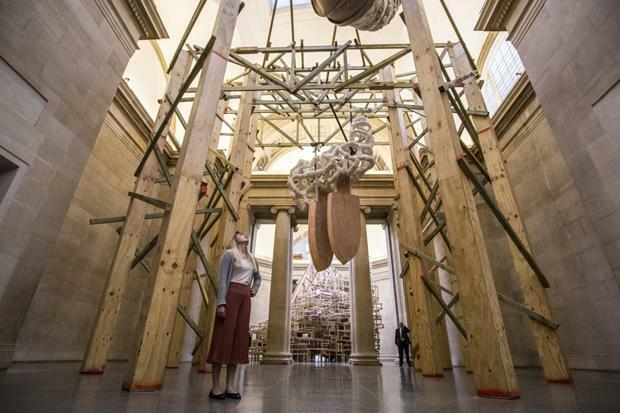 The other visible duality emerges from the appearance of Duveen Galleries with its classical architecture and historical undertones, symbolizing a distant understanding compared to the standards of Barlow’s manually labored, risky monuments, held together by cardboard and tape. Contrasting with the exact definition of what a monument is, Barlow’s assertions rely on scale, while challenging the monument’s common understandings of durability and rigidness. Perpetuating spontaneity in execution, Barlow’s installations capture the viewers’ attention through their inviting colors and geometric innovativeness, while stimulating the eyes through their unstable and astonishing structures. Phyllida Barlow is on view at Tate Britain through October 19, 2014. 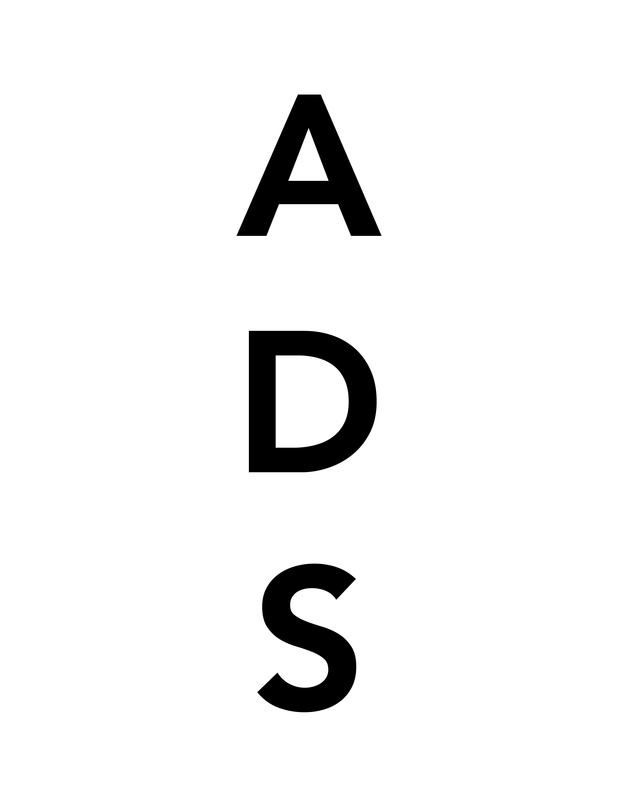 This entry was posted on Thursday, August 28th, 2014 at 12:00 am	and is filed under Art News. You can follow any responses to this entry through the RSS 2.0 feed. You can leave a response, or trackback from your own site.